Herbal extract for external use. It has a pronounced effect on inflammatory conditions affecting the mucosa and the skin, including the outer auditory canal. It balances the pH of the skin and mucosa, hence preventing the multiplication of undesirable bacteria, fungi and parasites. It exhibits antiviral, antibacterial and antimycotic effects. - Inflammatory skin conditions – rash, eczema, and surface wounds [Gynevet, Regavet, Kingvet]. - Skin mycoses, ring alopecia (local hair loss) [Gynevet]. - Sexual organ mucosa mycoses (dilute for irrigation purposes!) [Cytovet, Gynevet]. - Warts and tumours of the skin and mucosa [Virovet]. -Skin itching and pain [Fytovet]. - Outer auditory canal inflammations [Cytovet, Imunovet, Renovet – necessary preparation]. - Against pain from small joint and mammary gland inflammations [Kingvet, Imunovet]. Dab the affected area with 1 to 3 drops (depending on size) two to three times a day. In cases of affected ear apply 1 to 3 drops to a cotton swab and wipe the affected auditory canal twice a day. Only clean and wipe in cases of ear inflammations. Do not apply in drops! The ear has to stay dry. Do not apply into eyes! Keep out of reach of children! 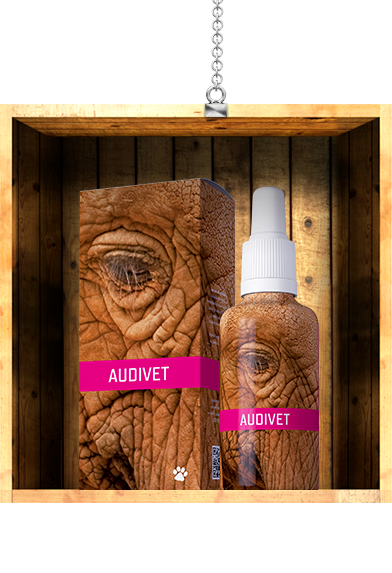 Audivet is indispensable for me in external treatment of local alopecia (hair loss), fungal skin affections, skin eczema as well as warts. It may be effectively used also for surface wounds of the skin. It acts positively in gum inflammations affecting carnivores.